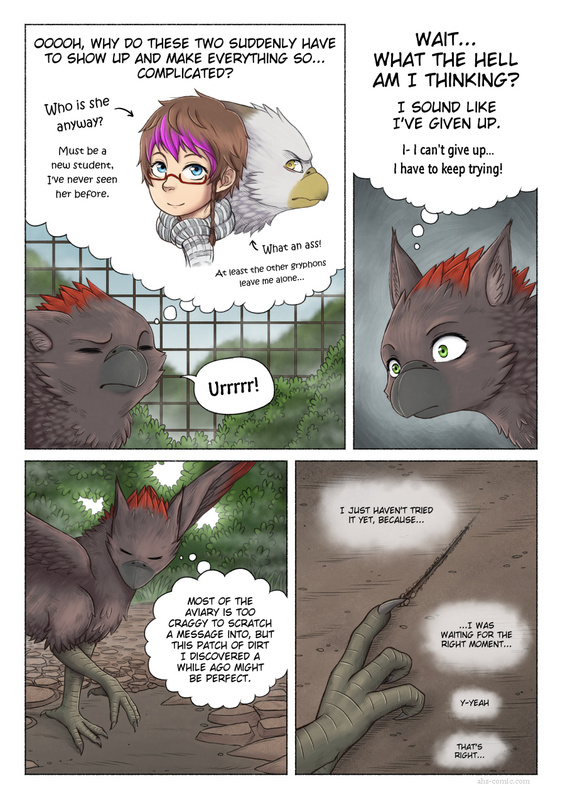 A look into the mind of a bird- uh, person!? This page really did my wrist in. I really have to take some time off soon, but I still want to finish a few more AHS pages before I do so. Also: I’m not sure how you guys feel about this, but I think IFF and AHS should be more seperate. I think a new website would be bad, but I think its alright as it is, although adding another section to this site would well too. I hope your wrist will be better soon — take care of yourself. Well, I think you are right AHS and IFF should be a bit more separate. I would suggest you just make a separate entry page for IFF at ahs-comic.com/iff as a landing with the newest update showing and a link to it on the normal landing page and that only showing AHS. I do not know how your back-end works and how much work that would be to realize. Yeah, something like this is what I’m thinking about. With the back-end I’m using, It should actually be really easy. The hardest part would be drawing a new banner for it, when you consider how bad I am at the htmls, that’s pretty good. I think this and AHS should have separate RSS feeds, seeing as I subscribed to AHS and ended up with this in my feed. All good for now, seeing as I think I’ll follow this anyway, but I think it would be a good idea. Now this would probably be a lot harder to do. Not sure if I can even do this, or want to for that matter. But I can see where you’re coming from, so I’ll look into it. I mean, I’ll just subscribe to both anyway, but some might want only one. Please use an ice pack, cut back on your drawing, or whatever you need to do to help your wrist, sooner rather than later! These kind of things usually get worse if you ignore them. A new section would be great. This is probably another student. Ehh, I’m kinda iffy on that, because I really don’t like things being outside of my control. That’s why I’d rather you don’t. Awesome comic. Hope to see this continue, it has loads of potential.